This post is long overdue but I still feel the need to blog about it anyway. The event occurred days before Christmas and due to the busy season, I never really had the chance to spend some quality time in front of my laptop. I felt that this post needs time as I am about to share one of the greatest gifts I have received last Christmas 2012 or perhaps in my entire existence. Aside from the blessing of friendship and the material gifts I received across the miles last Christmas, I was inspired by the good news I heard from one of the people I trusted so much. After hearing everything from him, I immediately thought of the famous bible story David and Goliath. 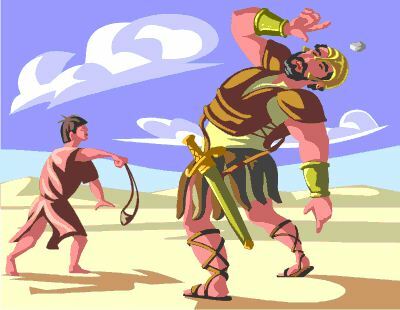 David, the youngest son of Jesse defeated the giant Goliath in the battle (1 Samuel 17). I am inspired by David and can personally relate to the story because despite his disadvantage, he volunteered to fight Goliath. What was so admirable about David is his unwavering faith that God will fight the battle for him and for the rest of Israel’s army. I consider myself as David that despite the insults, mockery, intimidation I received from the people who thought of themselves as Goliath, I still fought the battle of faith to be able to fight for my right and for my dignity as a person. I was vindicated by the initial decision of those in authority but the battle that I am fighting is still ongoing. I fear not for I know that my Lord is a just and faithful God. Despite what these people did to me, I never hold grudges against them nor go out of my way to hurt them back or destroy them just like what they did to me. In fact, I am always thankful for what happened because I believe that God used them as instruments for me to experience these things and learn from it. “Never take your own revenge, beloved, but leave room for the wrath of God, for it is written, "VENGEANCE IS MINE, I WILL REPAY," says the Lord”. I can sleep soundly at night knowing that I have never wronged or hurt anyone. As a wait for the finality of the battle I am fighting, I am living my life with serenity for I am confident that no matter how big my opponents are, my God will always be bigger than them and I know that He will be the one to fight and WIN that battle for He knows that this is not only my own battle but also for those people who were oppressed by Goliath. Mommies are always busy, I hear ya. My kids love this story, we have a book and a disc of this..
oh Rovs, indeed there are those who thinks that in order for them to be Goliaths, they put people down or intimidate them, so sorry to know what you are going through, but I believe you are doing well in responding to these challenges and like David will triumph. I agree with you sis. If someone hurt us, it is good not to revenge so we have peace of mind. I believe in Karma as well. Amen.. ito rin ang kailangan ko this day, I am a David against my Goliath sisters and brothers. I know my God will fight with me. Amen! Like what the song I used to sing in church when I was a kid says, "My God is so big, so strong and so mighty, there's nothing my God CANNOT do!" Surrendering everything unto Him and believing in His power and love that He will fight the battle for us, always gives me the comfort of knowing that I will never be alone in any type of hardships life throws at me.. =) God is good all the time! He never will fail nor forsake us..
Amen, amen!!! Our God is bigger than the biggest problems we will ever encounter! David is one of my favorite Bible characters! He showed how a faith and relying in God brings success even with a giant rock hurdling our way! you're a good example of a great mum and a faithful christian te rovie. Thank you very much Ate Claire. You are one of the persons that matter to me and I am so thankful and blessed to have known you and your family. Amen sis, amen! Yes, I agree, our God is bigger than all the battles we are facing and He will never, ever forsake us nor leave us. I hope, whatever battle you have right now, it will turn out in your favor. The moment you trusted your battle to God, He already declared you winner. God bless your good heart.